The Overwatch crew is a limber bunch, and it turns out there are some pretty springy Overwatch fans, too. 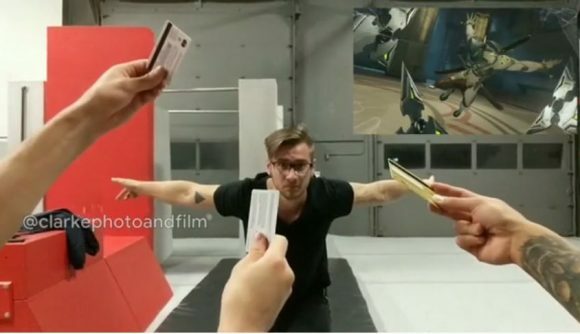 A group of them has recreated some of the game’s hero highlight intros using acrobatics equipment, Nerf guns, and… credit cards? This quick video clip posted to the Overwatch subreddit this week shows several athletic fans performing some of their favorite heroes’ highlight intros – Ana, Genji, Bastion, and Widowmaker all are represented with the appropriate flexes, flips, and weapon flourishes. I particularly enjoyed Bastion’s: there’s some creative license involved, since performer “@aaron_d.c” can’t actually turn into a tank. But he does pull off an impressive flip while holding an ersatz gun barrel. Then there’s the Genji highlight, which also starts with a great flip, and then gets around the three ninja stars problem with some impressive (and hilarious) creativity. Not all the moves require acrobatics, of course. The Reinhardt performance just needs a large sledgehammer and a strong friend. And of course, Widowmaker’s is all about attitude and a certain je ne sais quoi. Here’s the clip – thanks to Dexerto for spotting it. The original Overwatch subreddit thread can be found here. These impressive performances have made me think two things – First, maybe I should get back into Overwatch; and second, I really need to get back to the gym.